Whoever came up with the design for the hotdog and bun was brilliant. You lift it with your hand; it goes right into the mouth. It’s tidy. A juicy, fully loaded hamburger on the other hand, takes some skill. If you love burgers the way I do slathered with special sauce, tomatoes, onion, lettuce and cheese, it ends up being too big to bite into, and when cut it half usually comes out the other side of the bun. I think about these things, I really do. Sometimes, I even come up with or come across great solutions. So it is with the Cheeseburger Dog, the best idea yet for a true smart dog because it’s a hamburger that eats like a hot dog, and that makes it a whole lot easier to devour. For this recipe, the hamburger is not just ground beef. I’ve added some mayonnaise to help bind the beef and provide additional flavor. The shallots and seasonings also make it extra special. Then just roll the mixture into hot dog shapes and grill! (The leaner the beef, the less it will shrink, so if using, say an 80/20 blend, which is 80% beef and 20% fat, make your hot dogs larger!) For cheese dogs, just add a slice of cheddar at the last minute, just so it melts over the dog. Don’t forget to grill the buns, too. Then add your fixings and enjoy. I’ve also included a delicious recipe for a special sauce. I found it on Epicurious.com and it’s called the Epicurious Not-So-Secret-Sauce. This Cheeseburger Dog is one smart idea, and I can almost guarantee none of it will end up on your favorite game day shirt. Watch my video for The Cheeseburger Dog here! Heat a grill or grill pan. In a bowl, mix together beef, mayonnaise, shallots, salt, pepper and paprika. Roll into 4 hot dog - shaped logs. Oil the grill pan lightly. Grill burger dogs until charred and thoroughly cooked on all sides. For cheese dog version, place slice of cheddar cheese over burger dog during the last minute of cooking, just so it melts over the dog. Place hot dog buns on hot grill to toast. 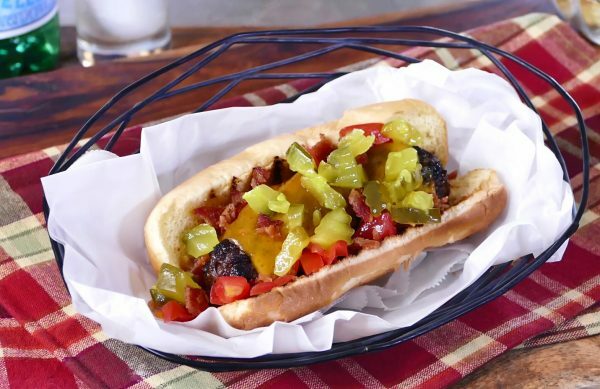 Place cheeseburger dog in bun and top with your favorite fixings. Mix together and spread on bun or on top of burger.